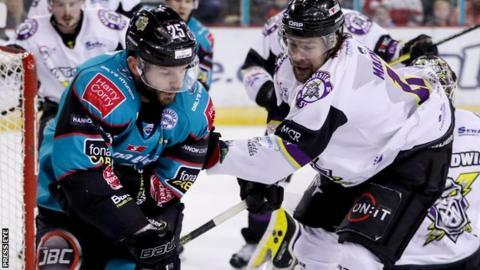 Belfast Giants maintained their Elite League title challenge with a 5-2 home win over Manchester Storm on Sunday. David Rutherford and Dustin Johner scored twice with Blair Riley grabbing their other goal at the SSE Arena. The victory means the Giants remain two points behind leaders Cardiff Devils with eight games left in the championship race. Adam Keefe's men, who lost 4-1 away to Sheffield Steelers on Saturday, entertain Glasgow Clan on Friday. The Giants took the lead at 9:51 when Darcy Murphy set up Riley, who was trying to find Rutherford but his attempted pass ended up going through the legs of Storm netminder Matt Ginn. The hosts doubled their advantage with only 10 seconds remaining in the first period with a bizarre play. Josh Roach picked out Rutherford who contrived to miss an unguarded goal, hitting the post. The puck bounced up in front of the net, eluded the swinging stick of Murphy who connected with defenceman Harrison Ruopp, and fell onto the arm of the Storm player as he hit the ice, trickling into the net. A goal was given as, on the delayed penalty call for high-sticking, it was a Storm player and not a Giant who touched the puck next. There was a long consultation between the officials before the goal was given, with the penalty called on the wrong Giants player and Rutherford sent to the box instead of Murphy in a case of mistaken identity. The video replay was then needed twice in the second period, helping to confirm the first goal for the Storm as Dane Byers smuggled the puck over the line before Giants goalie Tyler Beskorowany could reach out and pull it back. Jordan Smotherman's effort for the home side was then ruled out for goaltender interference on Jonathan Boxill. The third period was a grind with the Giants finally restoring their two-goal lead at 47:34 when Rutherford pounced on a rebound after a Jim Vandermeer wrist shot was saved by Ginn. The advantage did not last long with the Storm striking back 80 seconds later through Linden Springer. Johner scored top-shelf with less than two minutes to go to make the points safe and the same player rounded off the scoring with an empty netter. Cardiff beat Sheffield Steelers 6-0 to maintain their two-point lead over the Giants with a game in hand.